At least 11 people have died after a US Hercules aircraft crashed at an airport in Afghanistan, the US military says. 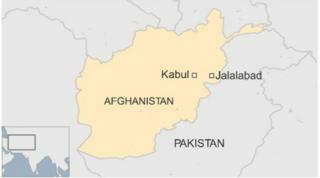 The C-130 plane crashed at around midnight local time (19:30 GMT Thursday) at Jalalabad airport. US Army Colonel Brian Tribus told AFP that six of those killed worked for the US military, while the others were civilian contractors. The C-130 is a military aircraft primarily used to carry troops and heavy cargo. Taliban spokesman Zabihullah Mujahid said on Twitter that the group shot down the plane, but agencies reported there was no indication of any such attack. The US military says it is now investigating the cause of the accident. The crash comes as US planes worked alongside Afghan forces to try and recapture the northern city of Kunduz from the Taliban. Close to 10,000 US troops are still stationed in Afghanistan after plans for a gradual withdrawal were changed earlier this year. President Obama has promised to leave only a small force in Afghanistan, based in the US embassy, by the end of 2016. Some 1,000 foreign troops are based in eastern Afghanistan, where the crash occurred, according to Nato. They are working alongside 40,000 Afghan troops. In July, a Hercules plane owned by Indonesia's military crashed in a residential part of Medan, in northern Indonesia. More than 140 people were killed, and it later emerged a number of civilians were being transported in the plane.